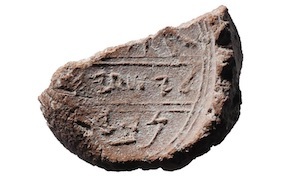 A fragment of a seal impression that bears the name of Isaiah was discovered during the 2009 season of the Ophel excavations in Jerusalem (cfr. Biblical Archaeology Review, March-May 2018). This seal impression (Bulla B12) is divided into three registers: the first register is almost completely missing, in the middle register the name lyš‘yh[w] «(belonging) to Isaiah» is impressed, and in the third register we find the word nby. As the left side is slightly damaged, Eilat Mazar suggests that a letter aleph could have been written at the end of the line, forming the word nby[’] «prophet». If this conjecture was correct, it would be a reference to the biblical prophet Isaiah. However, there are many problems with this conjecture (cfr. the critical notes of C. Rollston in http://www.rollstonepigraphy.com/). Two are the main problems. First, without the aleph at the end of the line, the word nby cannot mean «prophet», and, as there are no traces of this letter, it is not possible to draw any conclusion. Second, the Hebrew word nby is well known in other Hebrew seal impressions. It is either the patronym «Nobai», or the nisbe-ethnicon «Nobite», i.e. «from Nob» (cfr. W. Röllig, Siegel und Gewichte, in J. Renz – W. Röllig, Handbuch der Althebräischen Epigraphik, Bd. II/2, Darmstadt 2003, testi nn. 10.83; 13.10; 16.66; 21.82). In sum, I do not think there is any evidence that this bulla can be associated with the «prophet» Isaiah whose father was Amoz.